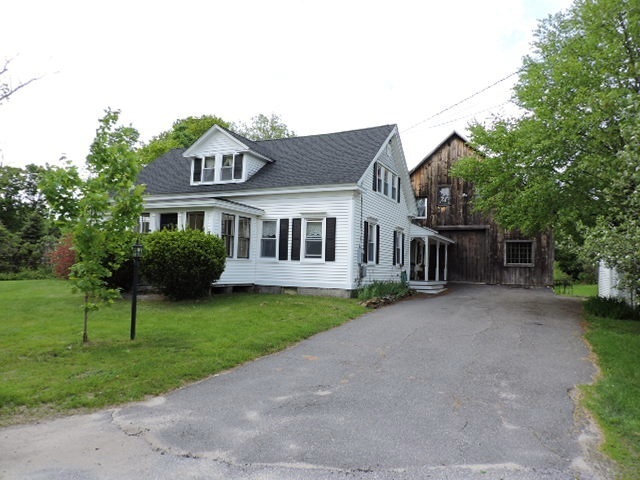 Very well maintained antique cape retaining all the charm of and older home with updated mechanical systems and a very functional floor plan like a modern home. Open kitchen layout with a spacious in home office area that lends itself to all kinds of uses as well as direct access to the barn. Kitchen area includes walk in closet , walk in pantry, center chimney with a beautiful wood stove. Lots of natural light in this home as it faces direct south for all day sun. Outside is a most beautiful yard with a number organic fruit trees and a level usable yard. This property is ideal for a small farm and a horse or two. Lot&apos;s of dirt roads and trails in the area. Very large attached barn (34x60) with tons of storage space and a work shop. There is also a 15 x 29 "man town or she shed" with electricity and a small overhead door. The entire house and barn was received a new roof a year ago. An energy audit was conducted on this home and improvements were made. This wonderful home is in move in condition and a must see.